You probably would have seen the front covers of both the local papers last week, and the excellent coverage of the ongoing saga of the trees in Claymore Close. If not, you can read them below or the Echo piece on WA Today. Since then, Cr Mel Congerton has moved a new rescission motion to revoke the previous decision to cut down both trees, and if successful, will move a new motion to cut down the Rose gum only. You can read the motion in Part C of the City of Swan Agenda for 7th May. While personally I still consider the removal of the gum unjustified, this motion has meant that the trees are protected for now. I invite all residents to attend the meeting tonight to hear the outcome. Additionally, we have called a Special Electors meeting regarding the matter of the trees and the broader issues it raises of council meetings and community consultation. See the correspondence from the City below advising that the meeting will be held on Monday 19th May at the Midland Town Hall. Please make sure you attend so we can discuss the matters listed below and pass appropriate motions relating to them. Hopefully any further decisions tonight regarding the trees will be deferred until after the Special Electors meeting. 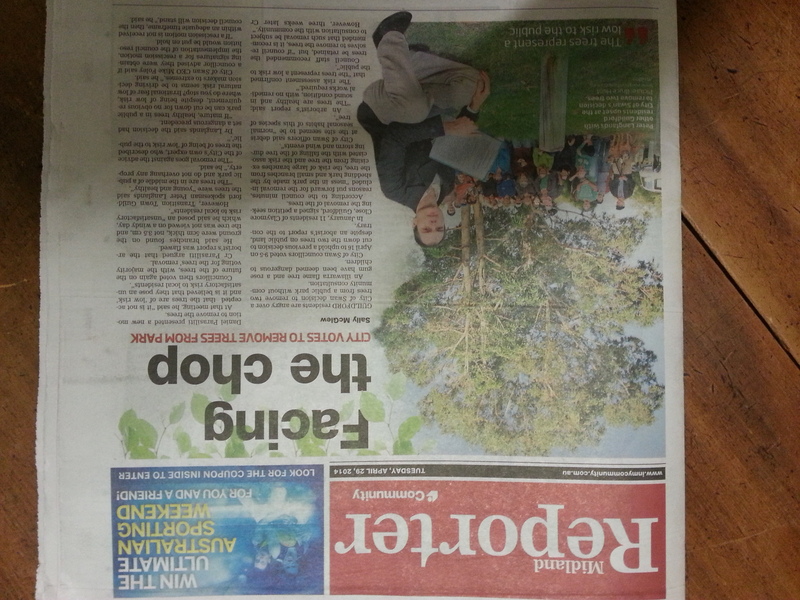 a) The meetings, motions and processes which led to the decision to remove two mature, public trees in Claymore Close, Guildford, and without community consultation contrary to the City’s stated principle of community engagement and as expressly recommended by officer in this particular matter and contrary to the expert opinion sought by the City. b) The transparency, accessibility and accountability of council meetings and councillors. The Mayor has advised that the Special Meeting of Electors is to be held on Monday, 19 May 2014 in the Auditorium of the Midland Town Hall, commencing at 6.00pm. Councillors have been given notice of this meeting and local public notice will be given via notices placed in The Echo, Midland Reporter, Bullsbrook Gingin Advocate and Hills Gazette. Notices will also be displayed in the City administration building and libraries. Special meetings are restricted to discussion on the matters specified in the request. These matters have been included in the notice of the meeting. An agenda will be prepared and available on the City’s website on Friday, 9 May. Information regarding the conduct of the Special Electors Meeting will be provided within the Agenda. The decisions made at an electors’ meeting are to be considered at the next meeting of Council. If this is impracticable, the decisions are to be considered at the subsequent meeting. However, it should be noted that any decisions made at a Special Meeting of Electors are not binding on the Council. If you wish to discuss any issue in regard to this meeting, please do not hesitate to contact me. 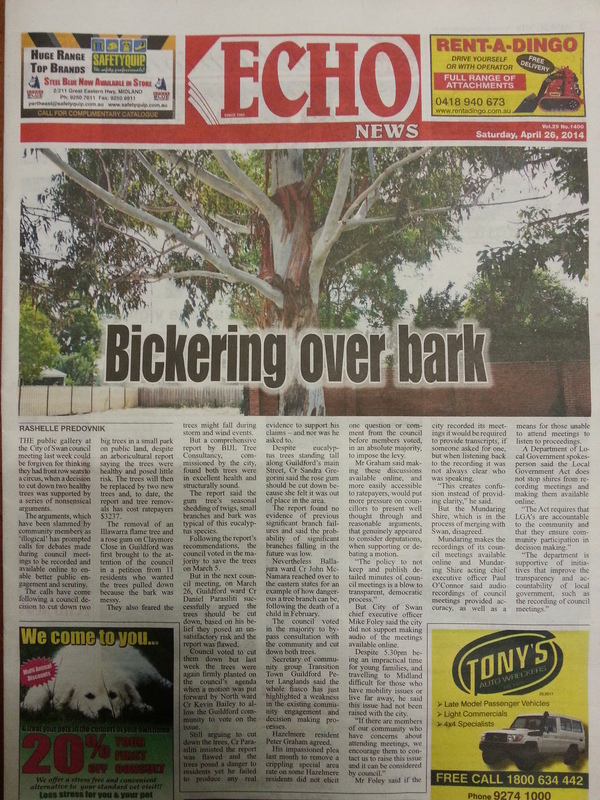 This entry was posted in Community, Environment, Flora & Fauna, Media and tagged City of Swan, Claymore Close trees, Cr Mel Congerton, Echo newspaper, Midland Reporter, Special Electors meeting. Bookmark the permalink.